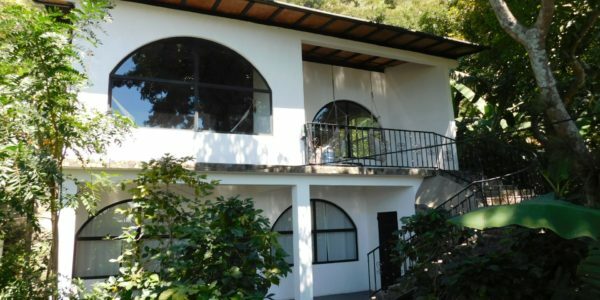 A fantastic property investment or family home in one of the most popular areas on Lake Atitlan: Paxanax Bay, Santa Cruz. Could be a home and rental, or even turned into a hotel or hostel. There are potentially 4 different rentals on the property. The houses are surrounded by colourful gardens and mature coffee plants. Entrance from a pathway in front brings you into the front garden and the first, larger Front House on two levels. A front door leads you into the lower level, which has a separate bedroom area and a small half bathroom space, with the large space built around a large natural rock. 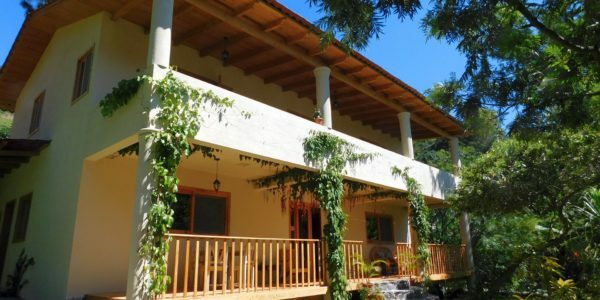 Stairs lead up to the upper level which is a large, light studio living space at present with kitchen, dining and living area leading out to a balcony covering the full length of the house and with fabulous views out over Paxanax Bay, Lake Atitlan and the volcanoes beyond. The bathroom with shower is in a small, separate structure of 3 levels behind. The bathroom is on the ground level, a guest bedroom above and then an open terrace on the 3rd level boasting further great views. Behind this is the second Back House, which is also for sale separately (click here for details). This house also has two levels each is with large open-plan spaces, both with a kitchen and space for a double bed. The lower level apartment has an outside bathroom under the stairs, but the upper level’s bathroom is inside. Both houses have their own bodega and have water pumped from the lake through a sophisticated filtration system. Electricity is from the national grid.